As unpleasant this topic may be it is vital to the understanding of why some of us have chronically failing health. It all begins in your gut. The inability to defecate is never a problem till it is difficult. The medical world and the lay man’s world define this problem differently. If you have trouble emptying the bowel on a regular basis or have to strain or feel it was inadequate or have a bloating sensation it is constipation. The medical world looks at the irregularity of bowel movements less than 3 times a week in the last 3 months. Let me educate you on why healthy and regular bowel movements are vital to good health. Constipation accounts for 16% of the primary care visits in this country. The testing costs anywhere from 6.5 billion to 7.5 billion dollars. We harbor in our gut trillions of bacteria that are collectively called “the microbiome”. We have more bacteria in( lungs and intestines)and on our body ( skin) than our own cells. 10% of our caloric intake comes from this bacteria in our gut. 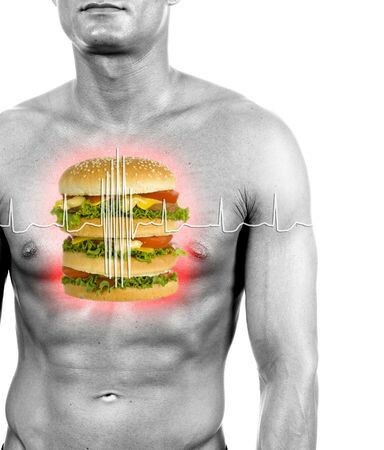 It affects our metabolic and energy production process and therefore our weight. It is also implicated in the immune process and can be responsible for autoimmunity( conditions like Hashimoto’s, Rheumatoid arthritis, lupus etc.). It protects us from serious infections. The right bacteria can prevent irritable bowel and autoimmunity. 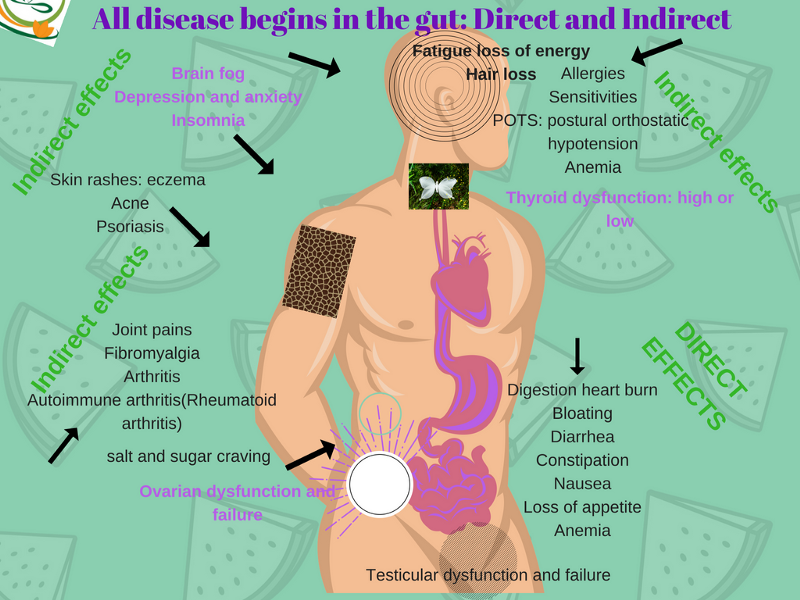 The gut has several enzymes that are geared to help us recover from an acute infection. They determine our food tolerances, example: lactose intolerance. Cancer cells express a sugar that attaches itself to cancer producing bacteria so the microbiome is potentially known to change in cancer cells and also in inflammatory cells like ulcerative colitis. So what really causes constipation? There are several forms of constipation. 1.Primary which means nothing from the outside of the gut is causing it. 2. Secondary which means it is due to something else. So when we have muscle problems or nerve problems that prevent the gut from contracting and pushing out the contents it is called primary. Those conditions are medical and need to be addressed appropriately. What we can change are the causes that we can potentially control or secondary causes. The list is endless but I will address the most important ones here. What you eat, what you think and what you breathe can all cause disease, so self help is the best help. Medications: 900 different medications are known to affect the bowel movements. Metabolic hormones: Thyroid is the key among the hormones however constipation is connected to insulin and female hormones and adrenals. So we have to look at the whole picture. Mindset: this is the toughest. When we are chronically stressed the gut bacteria does change, maybe due to what we eat and the hormonal impact of stress, however there is an intricate connection between the gut and the brain. Early childhood issue with bowel movements do impact how the bowels move later in life. Before we take a pill long term or processed fiber long term run down the checklist. Are you taking high protein or high fat diet? Do you sit all day and not drink enough water? Were you started recently on antibiotics? Irritable bowel diagnosis means your gut bacteria is different from normal people. Have your hormones been checked? Fiber rich diet can improve movements. Diets that increase certain type of bacteria especially those that produce methane are known to cause less bowel movements. The need for pure water cannot be underestimated. We have to have at least 2 to 3 quarts a day . 99 % of our body in the molecular level needs water. I have met more folks who hate water( thanks to the world of ads on juice and pop)and so trying mineral water or even soda streaming your water may be a good start. Begin by assessing the fiber in your food. If you can use an app like myfitnesspal or any other food app start with how much fiber are you consuming. The Standard American Diet or SAD has about 3 to 10 grams. The oldest tribe in Africa takes in about 70 to 80 grams of fiber. Caution:Increasing fiber all of a sudden can cause bloating and pain. Fiber Rich Foods:Fruits and vegetables do have fiber but root vegetables and whole grain also have a lot of fiber. Another big group of foods are the legumes. Population eating whole grain, legumes , potatoes and having days of fasting all have shown to slow aging and cause less disease. Quick home remedy: Senna tea soaked prune or raisins. Soak overnight and eat the prune or raisin in the morning for a good bowel movement. Sedentary lifestyle is a risk factor for constipation. Bed ridden state in the elderly,hospitalization all are risks. Walking at least 5 minutes every hour if you have a sitting job can help alleviate this risk. Hormones produced by our glands and those produced by the bacteria all cause changes. Low thyroid can lead to constipation long before it is apparent. Insulin resistance and diabetes, probably due to the diet, can cause constipation so in some patients the use of metformin a medication for blood sugars comes as a relief as it is associated with loose stools. Increase in calcium caused by increased parathyroid hormone can also lead to constipation. Whether it is the bacteria in the gut causing mood disorder or the brain function due to a genetic mutation that is causing mood disorder is unclear. Gut bacteria has been clearly implicated in impacting the mood. So addressing the balance of gut bacteria with probiotics, diet and water has been shown to improve the mood. Exact science behind this is unclear but in irritable bowel the type of bacteria present in the gut is different from those with healthy gut function. 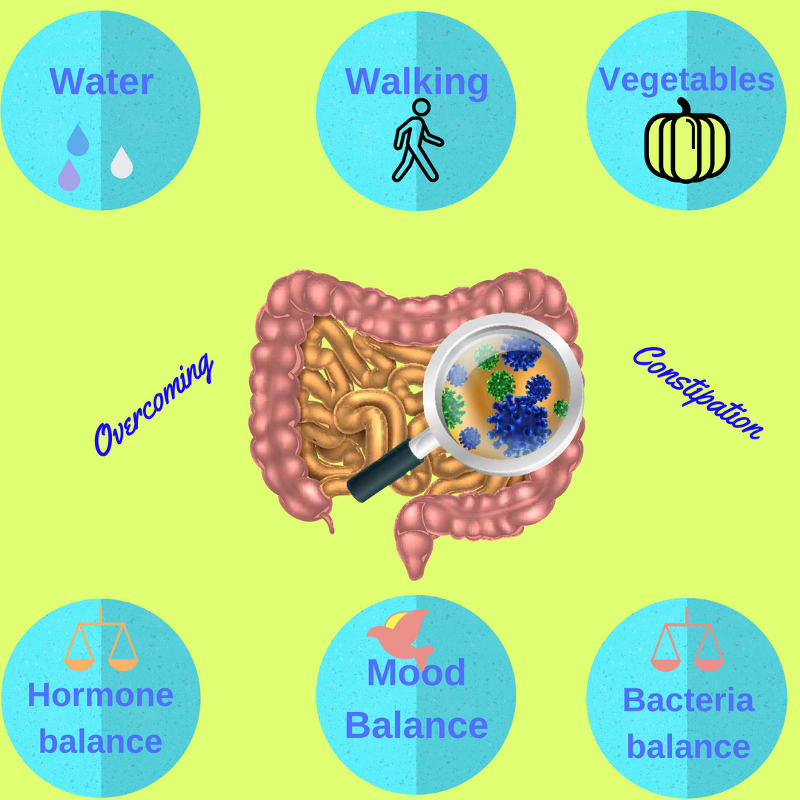 So changing the gut bacteria with lifestyle : stress reduction and adding fiber removing sugar and adding water is known to improve mood and movement. As long as you have no symptoms of any danger use this checklist before you go on any long term treatment for constipation. Remember consistency is the formula for success or failure. It is what you do consistently that keeps you where you are or gets you where you need to be. Disclaimer: All articles penned by this author are purely educational and should not be construed as medical advice or treatment.